After ten years of living in and exploring Wicklow, Seán Ó Súilleabháin has composed a magnificent and unique guide to Ireland’s Garden County. Commencing in January, each chapter covers a new month and thoughtfully details the subtle changes to be observed in the countryside and local wildlife. With stunning colour landscape photographs from fellow Wicklow-based author Chris Corlett and finely illustrated bird and nature imagery from Shay Connolly and John Murphy, this book is more than a seasonal guide: it is a vital resource for any lover of Ireland’s great cultural heritage and outdoor beauty. A keen hill-walker, nature enthusiast and English teacher, with in-depth knowledge and passion for the local area and Irish wildlife, the author offers a companionable yet informative handbook, with suggestions for walks, viewing points and information on areas of local heritage and history. With many interesting facts on Irish flora and fauna, such as bird migration patterns, wild-berry-foraging spots and mammals such as the badger, fox and pine marten, Wicklow bound is peppered with cleverly linked literary references and insights on the history and usage of the Irish language, as well as old Irish traditions and customs — from Halloween activities to leaving a coin on the old wall of Lord Meath’s estate. 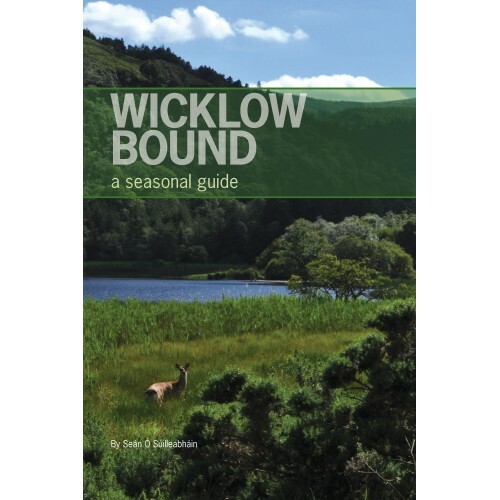 This comprehensive guide brings the reader to a wide range of locations and sites throughout Wicklow, both lesser known and well known, including Killruddery House, Brittas Bay, Mount Usher, Glendalough, Wicklow Gaol, Powerscourt, Glen of the Downs, Kilcoole and the Wicklow coast. The walking trails mentioned are accompanied by location details, points of interest and useful information such as route length and accessibility for walkers. The suggested itineraries in the appendices will be of great value to Wicklow residents, day-trippers and anyone journeying along the path of Ireland’s ancient east. (inc. suggested itineraries for visitors).